Hasse (1699-1783) was 14 years younger than Bach or Telemann (both born in 1685). On the other hand, Hasse was 33 years older than Joseph Haydn and 57 years older than Mozart. So what? Well, Haydn's earliest known mass was composed in 1750, when he was a mere 18 years old. Bach's great B minor Mass was compiled from earlier works in 1750 also, when Bach was 65 and near death. Hasse was 52 when he composed the Mass in D minor recorded here, but in every way -- in form, affect, and aesthetics -- Hasse belongs more to the generation of the much younger Haydn than to that of Bach. His Mass in D minor is thoroughly a work of the Enlightenment: symmetrical, lucidly rational, celebratory rather than penitent, 'public' rather than personal, a concert of elegant music rather than an outpouring of spiritual energy. It's not as great a work as Bach's -- let us not be unclear about that -- but it's a wonderful composition in its own way. 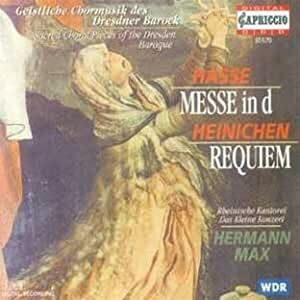 If you have heard and appreciated the Haydn and Mozart masses, you'll find this mass quite as excellent as those. In fact, Hasse's mass sounds very much like Haydn at his best, in the masses that Haydn wrote 40-some years later for Esterhazy occasions. Johann David Heinichen (1683-1729) was two years OLDER than Bach, and his Requiem in E flat major was composed in 1726, but it also has more in common with Hasse and Haydn, in style and structure, than with Bach. It's as 'optimistic' in affect and galante in style as any later Enlightenment sacred music. Once again, it's public and celebratory rather than anguished and personal; even the "Dies Irae - Day of Wrath" sections sound elegantly cheerful. I don't mean that the music is shallow. It's not; it's profoundly mathematical and adventurous in harmonic structure. It belonged to an era of more Faith in Man and Man's Reason than Fear of God's Judgment. Possibly it was the Italian influence that separated Hasse and Heinichen from Bach and Zelenka. Or perhaps it was the outcome of the Catholic Counter-Reformation, though Heinichen was himself a Protestant. Hasse and Heinichen both worked in Saxony, in the Electoral Court in Dresden, for large portions of their lives. But then, so did Zelenka, whose music remained as dark, dense, and conservative as Bach's. If you can project yourself back to the year 1726, to listen to works by Heinichen and Hasse, Zelenka and Bach with the ears of their contemporaries, you'll grasp why most people heard the former as the innovators and the latter as the stubborn old-timers. Hermann Max and the Rheinische Kantorei / Kleine Konzert perform this repertoire with all the symmetry and clarity it demands. The soloists are soprano Maria Zadori, alto Lena Susanne Norin, tenor Hans Jörg Mammel, and bass Klaus Mertens, all deservedly 'super stars' in the world of Historically Informed Performance. The original instruments include eight violins, four violas, contrabass, two flutes, three oboes, two horns, two trombones, bassoon, percussion and cembalo -- robust forces that would have been of the highest skill in the Court of Dresden, and are equally skilled now.